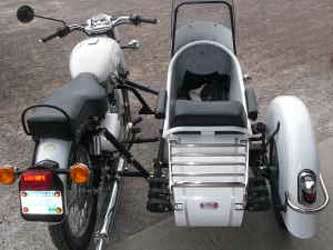 A 2006 Royal Enfield Bullet with sidecar, for sale on CraigsList in Michigan, shows an interesting modification that never occurred to me. The owner has added a tail light to the sidecar wheel fender, and mounted an extra turn signal to the outside front edge of the sidecar. The effect, especially at night, would be to visually "widen" the motorcycle to almost automobile width. It's clever, and I'll bet it really does increase safety, at least marginally. We know that automobile drivers don't seem to have the same subconscious respect for motorcycles they show for approaching cars. A driver who would not dare pull out in front of an oncoming car will do so in the path of a motorcycle. I don't think it's a mean streak. I really think it's the experience, repeated hundreds of times daily, of judging how close a car may be by how far apart its lights are. If a motorcycle somehow had widespread lights, it might be more intimidating and thus safer. 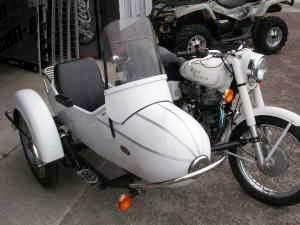 Maybe the solution would be to put a headlight in the nose of that sidecar!